Constructed from galvanised steel, Hoop Top Bike Racks are an effective solution for bicycle parking. Capable of securing two bikes at a time, this hoop is surface mounted and available in a stainless steel finish. With a classic hoop shaped design, this product is ideal outside of offices, residential buildings and social hubs, offering an easy and space efficient way to secure ones bike. 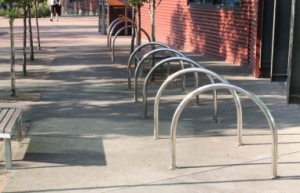 Manufactured in Australia, Hoop Top Bike Racks are designed to support the entire bicycle frame and can be installed in an assortment of configurations to best utilise the surrounding space. The Hoop Top Bike Rack measure 950mm(L) x 850mm(H). At NJM Group we are committed to providing products and services of a high quality that consistently meet our customer expectations and industry standards. Our Hoop Top Bike Racks have been tested and are compliant with Australian Standards AS2890.3 for Bicycle Parking Facilities. They can be installed on our locally manufactured bike shelters or crash rail containment barriers as well as being complimented by our fixed bollards for further protection against vehicles that may be parking close by. Australian Bollards can offer a customised solution to suit your bike storage needs. Bike hoops are used in different areas along cycle routes, cycle destination points and public attractions. Not only do our Bike hoops provide a place for cyclists to lock their bikes, they also provide incentive for cycling. The council encourages healthy living and cycling is a healthier and cheaper option to public transport and motor vehicles and is also better for the environment.